I was particularly interested in your article on edible Hibiscus. I am a 90 year old veteran, a former prisoner of war, stationed in Changi and on the Burma Railway. From your information I am enclosing an extract from a recent newsletter of our newsletter which has been running since 1946. Our Regimental Medical Officer, Dr R. Richards, is still with us and has been President of our Association since its inception. Many members know the story behind the name, but there are still some who don’t. Ian Painter wrote some time ago with a request for an explanation. In the early days of captivity some of the lads expressed concern that their inadequate diet may render them impotent and unable to father children when they returned home. The R.M.O. knew the leaves to be non-toxic, so he suggested the lads should eat these in order to maintain their virility. At least this could do no harm, so these leaves were eaten happily. When our Association was formed, in 1946, a newsletter was initiated by the first Secretary/ Editor, Scippy Maher. Items of interest, including reports of new additions to our families, were included. Remembering the R.M.O.’s suggestion that hibiscus leaves would aid virility. Scippy named the newsletter and that’s been its name ever since. I’ve cooked rosella leaves in curries and stir fries. They’re surprisingly tangy, a quality that earns them the name ‘sorrel’ in Africa (compare with European sorrel, Rumex acetosella, a sour-flavoured perennial vegetable). In West Africa and SE Asia rosella leaves are used for flavouring meals. The bright green leaves quickly turn yellow on contact with boiling water, another surprise for the uninitiated. Young leaves make good eating, and simmering them for 4-6 minutes makes them tender. In SE Asia, young leaves and tender shoots are also eaten raw in salads and chutneys, added to curries and for seasoning some Malaysian dishes. Many medicinal uses for rosella have been developed around the world. The calyxes, stems and leaves of rosella are antioxidant rich, calyxes especially so. Sudan tea, made from dried calyxes, is a particularly pleasant and healthy way to take these antioxidants. Like Hibiscus, rosella flowers contain mucilage, which makes a different kind of tea – one that relieves sore throats. Of course, the main reason we grow rosellas is for the red, fleshy calyxes surrounding the flowers, and these make a wonderful jam. The jam recipe I use was published in this blog in 2012. 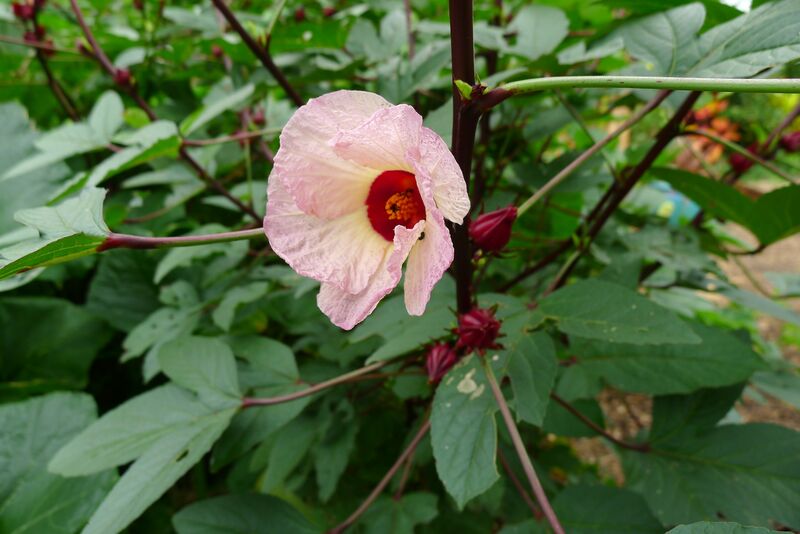 * Cranberry hibiscus, Hibiscus acetosella. A decorative, short-lived, evergreen shrub with leaves rather like purple maple, and upright, spindly stems. I imagine that in the wild this grows up and through other shrubs and trees as the stems break easily in wet, windy weather. Mine grows against railings, and I keep the stems tied in. This reaches 4m and is easily propagated by tip cuttings 6-8cm long. Flowers are beautiful, and can be used to make a pleasant green tea. Leaves taste slightly acidic because they are. Use them in place of sorrel, and lightly steam young, tender leaves as spinach. Rosella prefer a long, warm growing season, so here in Brisbane I sow them in early October. For best results, give rosella, okra, island spinach and Philip Island hibiscus all day sunshine and start them off in well dug, compost-rich soil. Make sure to water rosella and okra well during dry weather. My father was in Changi during the war and still alive today he is 95 and a half years old the only just recently that he told me about Hibiscus leaves so on that I know that it is good for you as he is still alive today thank you very much for allowing me to comment on your page.